Welcome to GameSpew Mountain and Ski Resort. We graciously ask visitors to clean any blood from previous guests. On an unrelated note, we are not responsible for any breakages in our ski lifts. 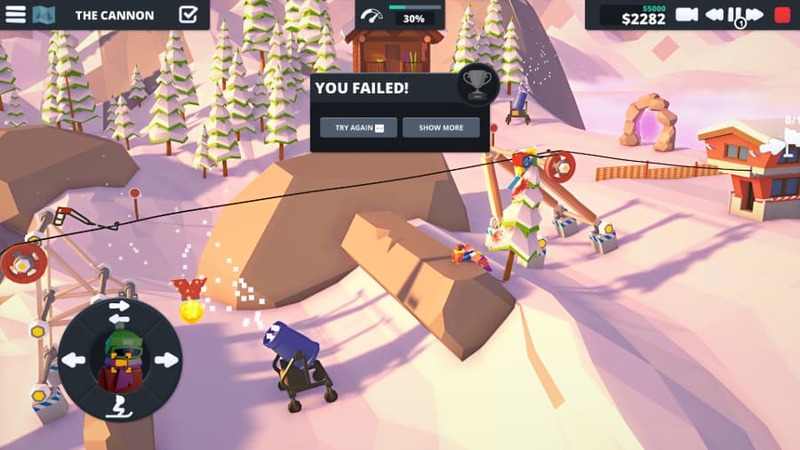 When Ski Lifts Go Wrong from developer Hugecalf Studios and publisher Curve Digital is a physics-based game about, well, building ski lifts. It’s a rewarding exercise, often managing to be funny and frustrating at the same time. In fact, the more frustrating it gets, somehow the funnier it ends up being. You’ll question your ability to construct safe ski lifts when you receive the achievement for causing the unfortunate demise of 100 innocent riders way before you’ve seen 100 riders safely pass the finish line. Trial and error is an understatement, and some riders barely get over the line, hanging upside down as they hold on to their bike, snowboard or skis for dear life. But the mere fact that you get achievements for killing riders means that When Ski Lifts Go Wrong practically wants you to cause devastation. As either blood pours out of your visitors, or it’s announced you’ve completed the level, you’ll gaze at your magnificent yet somehow functioning botch job, in awe at the scene of chaos that lays in front of you. 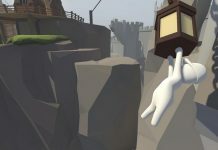 And that’s sometimes all you want from a little game about getting people safely up mountains, or across bridges. Using building materials of planks, logs, wheels, rope, foundations, and jump pads, your goal is to get various snowboarders, cyclists, skiers and the like to the finish line of every level. The tutorial guides you through well enough to start you on your way – including a refrain the game continues to remind you of, and for good reason: triangles are strong. Some levels will give you a small hint of what needs to be done, but most of the time you’ll get a few of materials and be sent on your way to come up with something. 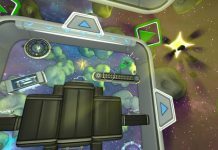 Hugecalf Studios has packed an impressive number of levels into the game’s campaign. So far, I’ve put eight hours into When Ski Lifts Go Wrong, and I’ve still got more levels to go at. For a £15 title, that’s a solid amount of content. No two levels feel the same, and you’re never reusing the same building strategies. Even after you’ve completed the campaign, you can make your own levels in the intuitive and user-friendly sandbox mode. 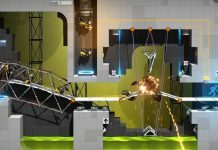 And if you’re playing on PC, you can try out levels created by other players using Steam Workshop. For a while, I was getting all the bonus objectives: bonus stars, making sure I kept in budget, and avoided breakages of any of my creation. Naturally, as When Ski Lifts Go Wrong’s campaign gets harder, hitting all three of bonus objectives becomes a tougher challenge. For most players in a puzzle game such as this there’s a point where you let those bonuses go, and completing the level is enough for you. But in When Ski Lifts Go Wrong, reaching that point doesn’t feel like defeat; instead, it’s a realisation of all the crazy solutions you could make, and the building aspect opens up more. So you start putting foundations everywhere, making drag lifts that force a skier to do a backflip before another drag lift picks them up on the edge of a cliff. And then after you’ve had your fun, you complete the level. All of this for no other reason other than you can – and it’s fun and rewarding to do so. 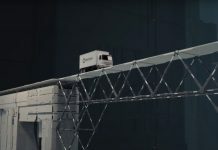 Some levels require you to build structures for motorised wheels to carry up passengers on drag lifts, gondolas, or your standard ski lift. On others, you’ll build platforms for snowmobiles and skiers to jump off of to land just where they need to to complete the level. There weren’t many levels where I was micro-adjusting to do this; most of the time if something didn’t work well, I started again from scratch, and ended up with a better solution. Playing When Ski Lifts Go Wrong on PC, I encountered an annoying bug after a few hours where no level in the campaign would load correctly the first time round. Upon loading a level the foundations I needed to build off spawned in mid-air and finish lines would appear inside the mountain, making them inaccessible. I’d instantly fail the level the moment I hit play. It’s annoying, but not entirely gamebreaking, as levels would load in correctly the second time round. The Steam Workshop levels, too, seem to have an issue.Any older level doesn’t load in properly with no apparent way to fix it, so I had to browse more recently made levels. When Ski Lifts Go Wrong is very much like Poly Bridge from Dry Cactus, and that’s no bad thing. 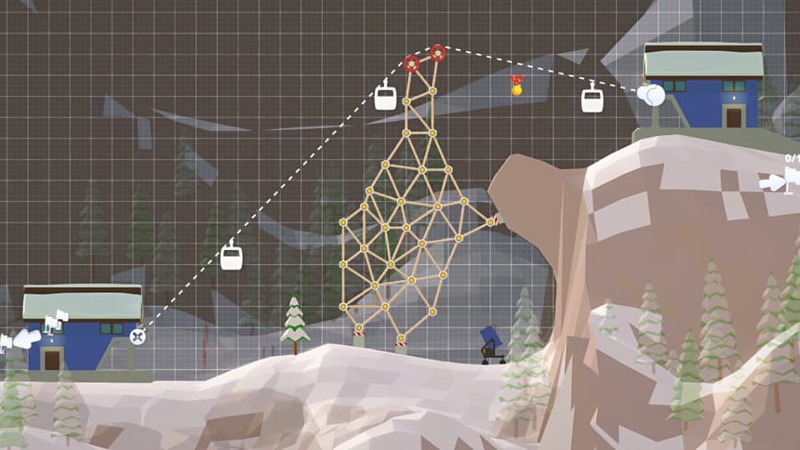 Aside from those irksome technical issues, Ski Lifts Go Wrong stands very nicely alongside Poly Bridge and other physics-based puzzle games of the same ilk. If you enjoy a good challenge – and a good amount of silliness – you’ll certainly get a kick out of this. 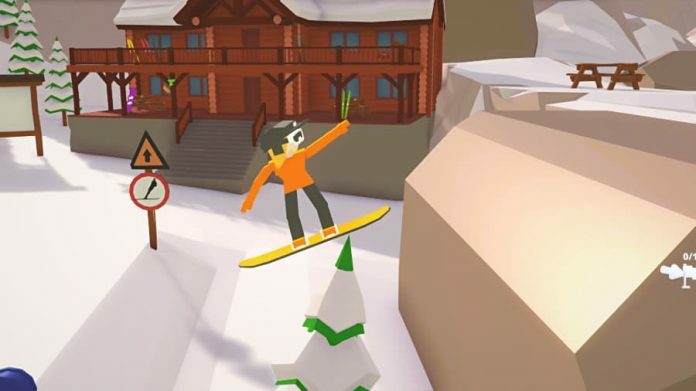 When Ski Lifts Go Wrong is available on PC and Nintendo Switch. 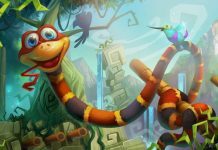 We reviewed the PC version.